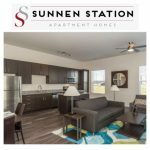 Sunnen Station Apartments is a brand new community in Maplewood offering an upscale experience in Studio, One Bedroom and Two Bedroom apartment homes. We offer luxurious finishes as well as premier amenity spaces in a prime location for your favorite local dining, shopping and nightlife. Our current lease promotion offers TWO FREE MONTHS on a 14 month lease. Sunnen Stations’s 1 Year Anniversary was on October 27th and we’ve been so proud to be a part of the growing Maplewood Community. Along with celebrating our anniversary we have also been proud to celebrate achieving the top 1% in the nation for online reviews through J. Turner reputation management!